Several readers of the Blake Newsletter have asked me for more information on Blake’s “Donald the Hammerer”  listed in my “Finding List of Reproductions of Blake’s Art” (Part IV, page 9, published in the supplement to the May, 1970 issue of the Newsletter). This pencil and ink drawing measures 7.8 × 12 cm. on the inner bordering lines and currently hangs in a back room of the Department of Special Collections of the UCLA Library. The block lettering of the title below the border appears to be in the same brown watercolor used as a monochrome wash in the drawing itself. Martin Butlin has very kindly given me some information on the history of “Donald the Hammerer.” Two drawings with that title were sold from the Linnell collection at Christie’s on 15 March 1918 (lot 167) where they were both bought by Parsons and subsequently offered for sale by Tregaskis in June, 1919. 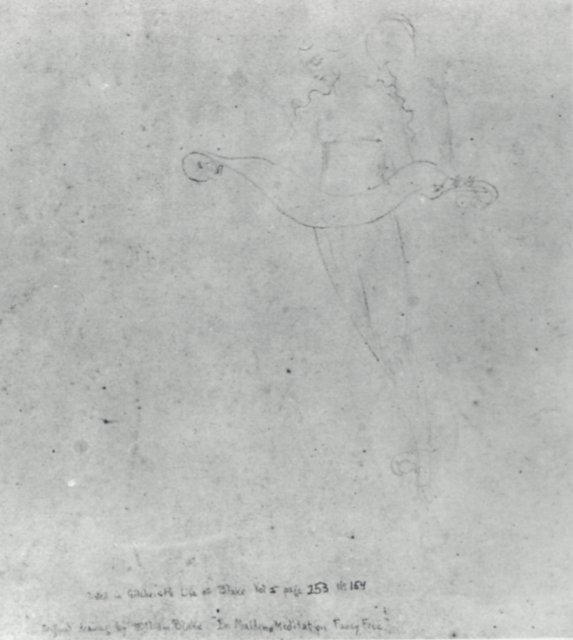 One of the drawings was in the George C. Smith, Jr. collection sold at Parke-Bernet on 2 November 1938 (lot 100). One version was sold by Rosenbach to Mrs. Landon K. Thorne, in whose collection Mr. Butlin saw it in 1966. The other version, now at UCLA, was given to the school by Miss Margaret Gage of Santa Monica, California in 1964. Man at a Forge, with a Woman and Youth. The basic description fits, but the wash exhibits no unusual care in application and the design has nothing to do with Europe. Mr. Butlin suggests that Rossetti’s catalogue entry actually refers to a separate color-printed copy of plate 21 of The Book of Urizen (Los, with Enitharmon and Orc) from the Linnell collection now in the National Gallery of Victoria, Melbourne. Indeed, it seems more likely for Rossetti to confuse two illuminated books than to write that a simple monochrome wash is “carefully coloured.” Donald himself does suggest Los in the illuminated books, both because of the instruments of his trade and his posture. The hammer is much the same as the one held by Los in The Book of Urizen, plates 18 and 21. Morton Paley has recommended Los on the last plate of Jerusalem as perhaps the closest parallel in the illuminated books to Donald, particularly in the tilt of the head and twist of the body. Martin Butlin has further pointed out to me the basic stylistic similarities between “Donald the Hammerer” and what is quite possibly a companion piece entitled “Los Walking on the Mountains of Albion” (pencil, pen, and wash drawing, 11.1 × 7.6 cm.) sold at Parke-Bernet on 13 November 1968 (lot 16) and reproduced in the sale catalogue. 1 “Donald the Hammerer.” From the Department of Special Collections, The Library, University of California, Los Angeles. begin page 77 | ↑ back to top suggests an illustration to some work of literature not by Blake himself. Unfortunately, after a good deal of searching I have been unable to discover just what work might be illustrated. 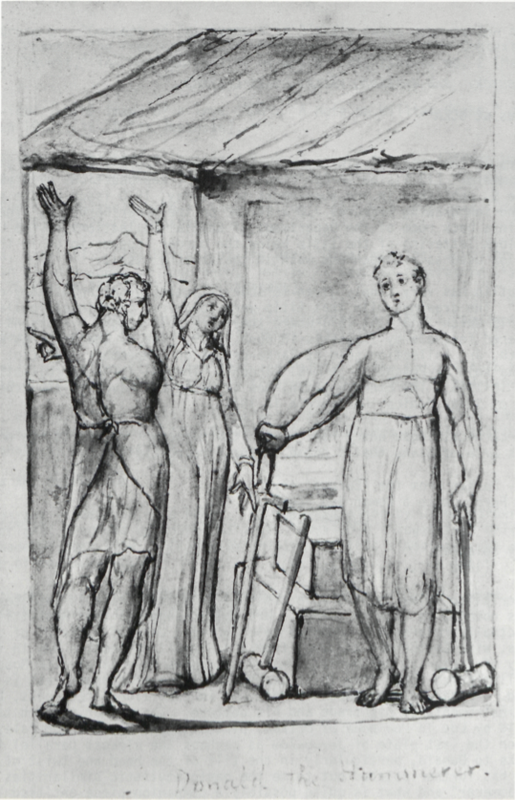 The drawing technique, facial expressions, and bodily gestures have much in common with some of the designs for Paradise Regained and Pilgrim’s Progress, although the coloring is far more vivid in these two series than in “Donald the Hammerer.” Every motif in the drawing can be found in other works by Blake (compare for example the young woman’s face with Mary’s in the fourth design for Paradise Regained), but these common forms point more to basic motifs in Blake’s pictorial vocabulary than to any thematic similarities between “The Hammerer” and other designs. I would appreciate hearing from anyone who can identify Donald and his two companions. 2 Drawing. From the Department of Special Collections, The Library, University of California, Los Angeles. 3 Drawing. From the Department of Special Collections, The Library, University of California, Los Angeles. conveyed by the motto above suggested. 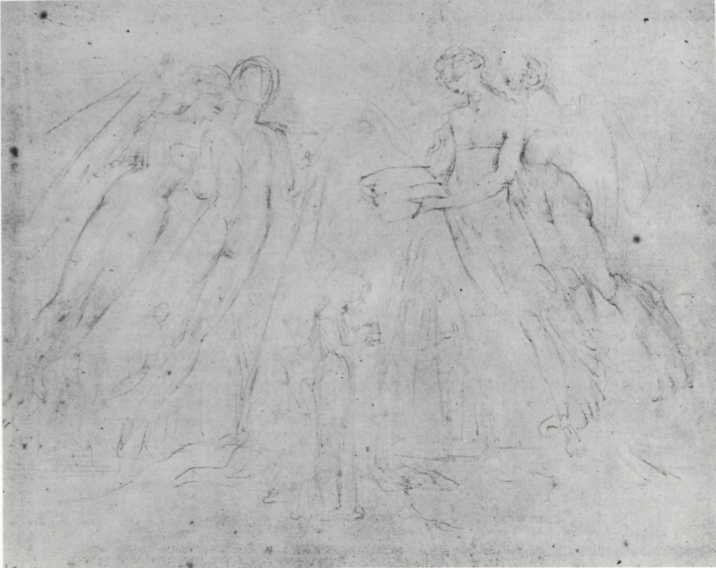 This is very likely a preliminary study for “Enoch” since the four large figures in the sketch correspond closely in their lineaments and arrangement to the hovering spirits in the lithograph (reproduced in Geoffrey Keynes, Blake: The Separate Plates, pl. 26). The small central figure does not appear in “Enoch,” but a girl reading a book is certainly compatible with the youthful representations of Poetry, Painting, and Music in the print and may well be part of an early version of the finished design. On the back Blake has drawn two figures , apparently a version of the figures on the right of the main sketch with the open book replaced by a scroll, as in “Enoch.” The note at the bottom of the sheet refers to the catalogue entry in the 1863 edition of Gilchrist, which is the same as that quoted above except for the added point that the sketch was owned by “Mr. Harvey.” Mr. Butlin tells me that Harvey probably acquired it at the anonymous Frederick Tatham sale at Sotheby’s on 29 April 1862 (lot 200 or 201). This drawing, like “Donald the Hammerer,” was presented to UCLA in 1964 by Miss Gage. I have been unable to locate her for any further information she may have about these two small but interesting works. I wish to thank Mr. Brooke Whiting of the Department of Special Collections of the UCLA Library for his kind assistance.